"Perhaps you have had a Meal Worm larvae yourself? Could be. They are found in bottles of Mexican Tequila! 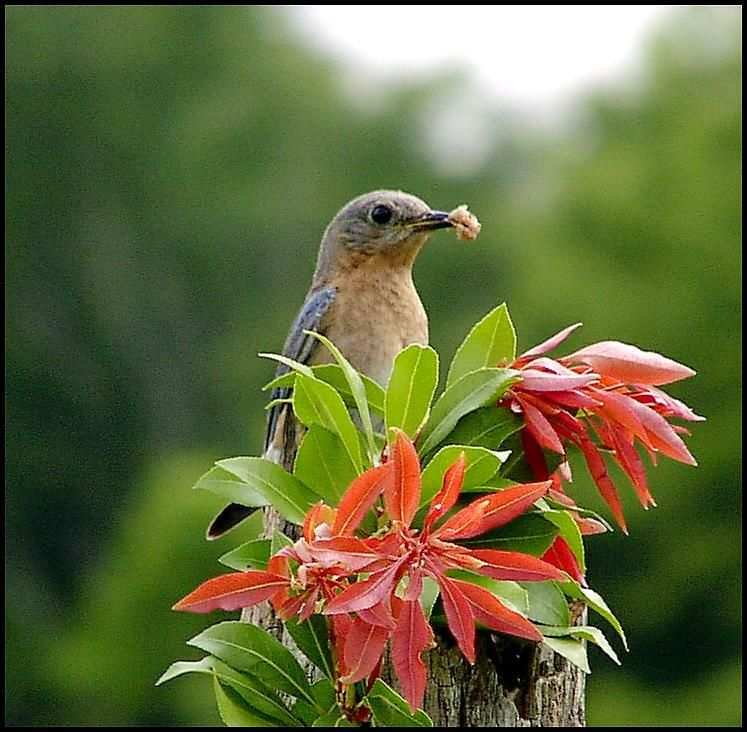 If ya ask a Bluebird, it might say, "A Crawling Gourmet Meal!" If ya ask a Mealie, they might say, "I gotta kept moving!" Actually we are going to learn together what is a Meal Worm. First the name seems to direct us to think that these worms are to be Something's dinner. On this page you are going to find Links to Meal Worm sites. Because of copy writing and use laws, to actually place others materials on to this page, is probably not proper. Do CLICK on the sites below, you will find on this page, they will, within seconds, take you to their Meal Worm page. You will find explanations of the Meal Worms, and some Bluebird feeding information. Most sites will tell you how to simply grow your own Mealies. Take a look. The sites are only a page or two long and have photos! MAINTAINING A MEALWORM FARM by Carol Heesen - www.birds2grow.com/art-mealworm-farm.html A one page article where an individual like yourself is successfully growing Meal worms. She uses four plastic box drawers from Wal-Mart and gives you step by step how to do what she does to grow Mealies. 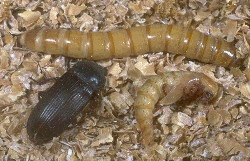 MEAL WORMS/DARKLING BEETLEby Critter Corner of East Chapel Hill High School NC - www.teachersnetwork.org/dcs/critter/mealworm/ On this site find a large photo of the adult beetle and also the worms. There are short brief facts which are all you will probably need to know about this Critter. MEAL WORM FEEDING by John Thompson- audubon-omaha.org/bbbox/bbrp/mealworm.htm John Thompson has had a bucket of Mealies going for ten years. Look and see how he is doing that. RAISING MEALWORMS YOURSELF - sugarglider.safeshopper.com/81/212.htm?69 This is a business site which tells you how to grow your own Mealies. TAPEWORMS IN OUR FINCHES by Carol Heesen - www.birds2grow.com/art-tapeworms.html Could Meal Worms be more than just Meal Worms. Worth reading. Best info - Wash your hands when touching your Meal Worms. This another of Wendell Long's photos, until I get our own site Mealie Photos. I started my My Meal Worm Farm October 23, 2002. I did this by purchasing two small tubs of Meal Worms. I got them at a local Fish Pet Store. I would guess the quanity was 100 worms per container. The cost with tax was $8.64. I next needed a container. Now, if I had done all of the reading from the Meal Worm Links found on this page I would know I had many different types of containers to choose from. The five gallon buckets sound like a good way to go. But I purchased a clear plastic storage box from Wal-Mart. This box is almost two feet square with a locking top. The depth is approximately six inches. Inside my plastic box I poured in one box of Bran Meal which I found at Publix. The cost was $2.46 with tax. Then I poured in both of my containers of Meal Worms. On top of the meal I placed a piece of lettuce and noticed within hours it disappeared. I then took a paper towel and balled it up and ran it under the faucet. Then I squeezed out the excess water and opened it up but left it in a ball. I placed that right on top of the bran. I notice the worms come to the paper towel when they are wanting to get a little moisture. I need to get a potato or apple so I can put in a slice, which will last longer than the moisture in a paper towel. Did you notice the cost of the 200 worms and the bran so far? It is $11.00. Now if you surf the Internet for costs of Mealies you will find they run as low as $16.00 for 5000 worms. I will have to buy more bran meal, but my 200 worms should in time produce 50,000 to 100,000 worms. Some sites say a worm which turns into a bug will lay 250 or 500 eggs. Now that is a lot of worms! And I don't even have a bird to eat them....yet. Why would we need so many worms? I have read that a Bluebird will eat up to 400 a day. I am going to have to find where I read that figure because that may be for a pair of Bluebirds with babies. Otherwise....Is there such a thing as a Fat Bird? I will keep you posted on my Mealie Experiment. Perhaps you too would like to grow Mealies for your Bluebirds. I would suggest that you give a try to raising your own Mealies. Why? Because you are going to want to feed your Bluebirds. The Bluebirds do not have to have food placed around them. But since we do not have established Bluebirds coming to our yards, we do need to have something which will attract them to come and stay. The Bluebirds will also get to know you a little better because you are bring them treats. Also if something should happen to one parent, the easily accesible food will be of help to the remaining parent and will give the babies a better chance to survive. Note: The worms or the meal ...Do Not have any smell. These Bugs Are Since Nov 2002 /Still Alive And Breeding! My Mealie Project: Started October 23, 2002. The worm count purchased was around close to 300. It was one week later that the first worm changed to the stage before it becomes a bug. At this time I only have about 20 worms which have not changed. The others are now in another box of bran with driftwood pieces on top. The first bug appeared about a week later. And I noticed it died after living almost 2 weeks. Yes, I did know which bug because it had a torn wing. The wings do not help them fly. I have seen then jump and flap their wings for a second. It is more just a little noise. The bugs did love the potato placed face down on the bran for their moisture. The bugs do crawl all over the wood. I have not disturbed the bran at all. I have no idea where their eggs are. I do see the bugs mate often. Dec. 4 I saw the first new baby 1/8th inch long worm! I have over 200 bugs, 2 unchanged old worms. To find the babies at this time, with a knife blade I scooped a blade full of bran. To find them then you look to see if the bran pieces are moving, and if so they are there. I wonder if the bugs are eating these small worms? To play a bit, I took 32 oz plastic pop bottles and put 25 bugs in two bottles and 25 in the plastic box. That is where my bottles are laying on their side with a top cut out and an air hole. Each of the 3 new places have a potato slice added. I would like to now take out the bugs in the large plastic box, and put them in new bran and that should give the new worms a chance to grow. Dec. 7 I did take out all of the worms in the first bran box. Ya just can't see a thing. The bugs are still breeding. I have 2 worms and 1 between stage critter left. I think bulk bran is the way to go. The bran does seem to be being eaten. Dec. 27 I now have 3 boxes of Mealies. 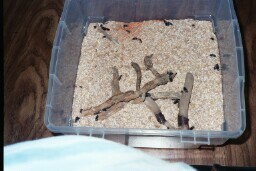 Two are boxes only for the new worms, and one still has all of the bugs. I have not counted how many bugs I still have, but I have found less than ten have died. The first box of baby worms is really a sight to see. As I take my hand and lift a few inches of the bran and then mound the brand up, I see the whole mountain of bran just swarming downward. The bran is just filled with the worms now. One piece of potato was almost solid worms when I lifted it. Actually it was something like out of a horror movie. Those worms are almost an inch long and now starting to get a bit more solid looking than clear. The second box of baby worms is now really coming alive. The bran when mounded up also is moving a lot now. I still see the bugs breeding. From reading the following links, I have read that the bugs will live at least two months. One article said they would live nine months. We'll see! ***Have you started growing your Mealies yet? You are going to wish you had when you see the Bluebirds around your boxes. Jan. 5 The first box of baby Mealies is really swarming around the potato slices. When I put my hand in the bran it is noticibly warm. I can actually feel the heat from the Mealies! Feb. 25 Lots and lots of worm babies! I now have 3 good size containers of worms. The bugs got moved to a new tub. They just won't die. The first batch of babies have grown and now are turning fast to the second stage and I already have a small bowel of new worms. I suppose if I had nothing to do, I could count the worms in the first box or wait until they turn into bugs. To see how many worms are layed in about 3 weeks time. One thing I find very interesting is that the second stage pupa, many that have turned black and dried up. I am thinking this is from the new finer bran, and also the worms could be sucking the moisture from them. I now am taking out the pupa as soon as I find them a couple times a day, which is making a difference. Then when I find they have changed into a bug I move the bug to the bowl. This is important stuff. The other two baby tubs are just swarming with movement, telling me there are hundreds and hundreds of worms. In the second box the worms are as long as an inch. The third box was where I had the bugs, and though I would just keep them in there. But I noticed the bugs going everywhere and very busy. I believe they were eating baby Mealies. The bran was also just rolling with movement. The babies are almost too small to be seen. I think I need a bigger box! June 1 I give! I give! Growing Mealies is way too successful! Eight months after starting I found I still had 21 live bugs from my original worms. I also had 6 containors and I really need more. I did sell about a half dozen Mealie Starter Packs, which helped pay for this project. But even taking away Mealies I have toooooo many to handle. In places in my box, the bugs can get two inches thick. I have tubs of baby worms which are starting to turn to bugs. I found it is very easy to grow Mealies and you just can't kill them. But, to do so I would suggest that you have lots of birds to feed, because you will have many many worms. You also will need a space to place your boxes. To get many worms you need to work in those boxes moving bugs to new bran after a few weeks which leaves the eggs to grow up and not be eaten by the bugs. OR, use just a 5 gallon bucket and put in the starter worms, bran, and add a potato weekly and let whatever happens. I don't believe this gets you quanity but should get you some worms. I have to get my Mealies off my dinning room table and end this experiment. I had fun but the fun of raising Mealies is over for me. RAISING MEALWORMS by The Food Insects Newsletter www.hollowtop.com/finl_html/mealworms.htm Note the Breeding time in stages. Also find Human use recipes! The males and females of the mealworm are indistinguishable. They mate 2-5 days after emerging, and the female lays up to 40 eggs a day. The eggs take 12 days. on average, to hatch. The larvae molt several times over a period of about 10 months, until they reach 25-30 cm in length. It takes about 12 days for the pupa to complete metamorphosis into an adults. The adult lives, generally. only 2 months. All in all, at temperatures from 18¡ to 25¡ C. the insect's life cycle is about one year. (Do you have too many Meal Worms? Place the cleaned and prepared insects on a cookie sheet and dry in the oven for 1 -2 hours at 100¡C (200¡F). Preheat oven to 190¡C (375¡F). In a bowl, mix the flour, baking soda and salt. In another bowl, cream butter, white sugar, brown sugar, and vanilla. Stir in eggs. Gradually add the flour mixture. Stir in chocolate chips and mealworms. Drop by teaspoonfuls onto a cookie sheet, and bake 8- 10 minutes.